It’s almost impossible to discuss about SEO and not mention the phrase ‘thin content’, and there is a pretty good reason for that. Search engines are constantly crawling the web to find and index new content, to keep their users happy. Webmasters are constantly trying to create new content to bypass their competitors, give search engines more reasons to re-visit their websites and keep their users engaged. The fact is, good content is hard to create and thus many webmasters are looking for shortcuts. What is the end result? Publishing low quality content for the sake of publishing and not taking into account what users really want. This in turn makes users unhappy and search engines get frustrated because their users don’t get what they want. When we say ‘search engines get frustrated’, it means that they change their ranking algorithms to get rid of low quality websites from their search results. When they do so, some websites lose their rankings and traffic because their content is not good enough. And this where the discussion about ‘thin content’ begins. Webmasters and SEO professionals are trying to understand what is considered to be thin content, how to identify which pages are conceived as ‘thin pages’ and most importantly how to fix it. So, what is really thin content? Does it have to do with word count or is it more than that? Thin content is content published for the sole purpose of manipulating a page ranking and adds no real value to the user. It is short and not authentic and no special care was taken to make it meaningful and easy to read. Typical examples of low quality content are auto generated pages, doorway pages, scrapped content, keyword stuffed pages or pages that have lines of text thrown on a page without meaning or purpose. Why thin content it’s bad for SEO? Why all the fuzz about thin content? Aren’t search engines clever enough to identify thin content and just discard it? For starters, when Google is evaluating the quality of a single webpage, one of the things they take into account is how many good quality pages are included in their index from the same website. So, having a website with lots of thin content pages, reduces your page rank and Google trust. Second, in order to rank high in Google, you need to have great content that satisfies the search intent. Anything less than that will not get you anywhere close to the first page of Google, no matter what tricks you try to deceive their algorithms. I have said it many times in the past, ‘Content is king’. Websites with great content have more chances of ranking high in Google search with or without SEO, while websites with low quality content have no chances at all. Third, even if you manage to get high rankings with thin content, it won’t be of any use. Users will not trust or stay in a website that doesn’t give them what they want and a few lines of duplicate content on a page, is not what they want. In other words, if you intentionally publish thin content for the sole purpose of improving your rankings, you are just wasting your time. It will not work. Even if it works now, it’s only temporary. In one of the hundred algorithmic changes that Google is doing on a yearly basis, you will get caught, lose your rankings, imposed a penalty and possibly banned from Google. The changes to the Google algorithm related to identifying and devaluing low quality pages is now part of the on-going Google algorithm. This means that as part of the normal process, the algorithm will check and identify low quality pages and remove them from the index. Websites that have many low-quality pages may be imposed either a manual or algorithmic penalty. Hint: Read this article to find out if your website is penalized by Google and how to get out of a Google penalty. In the past, this was not done on an on-going basis but it was done every few months. The algorithm responsible for fighting low quality pages is known in the SEO community as Google Panda. Obviously thin content is not the way to go, what does Google want to be happy? In short, Google is looking for content to satisfy the intent of the searcher so that they keep coming to Google for all their search needs. Watch this video from Google where they discuss about thin content. Watch a video from Google explaining what is thin content and how to fix it. How to identify thin content? I have mentioned above that if you intentionally create thin content, you shouldn’t have any expectations in terms of rankings. Unfortunately, this is not always the case. You may have thin content pages published on your website not because you wanted to, but because Google believes that they are low quality pages. How does Google identify low quality pages? Content formatting – does the page has a valid structure with proper headings? Speed – slow pages don’t provide a good experience for the users. If your pages pass the above tests successfully then Google checks how well the page can satisfy the user intent. This is perhaps one of the most important step because even if you have a page with great content but this is not what users want, then this page is not good for Google and for you this means it’s a page that needs to be improved. If this sounds weird, don’t worry, it happens to all websites, especially as they grow in content. What can you do in those cases to protect or recover your Google rankings and traffic? The answer is simple (but not easy to implement): You need to identify which pages are considered by Google as ‘thin pages’ and fix them by either making their content better, removing them or redirecting them to other pages on your website. How can you find thin content pages? This process is called a content audit and it is recommended to do even if you don’t have any issues with thin content. 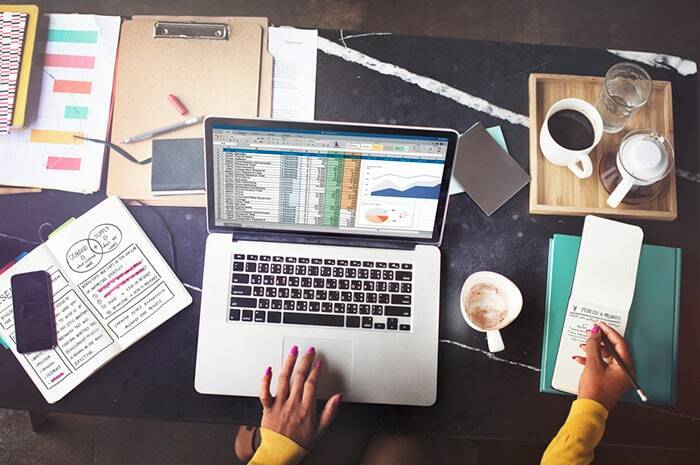 If you only have a few published pages then doing a content audit is easy but when you have a lot of pages, it will take some time and effort. 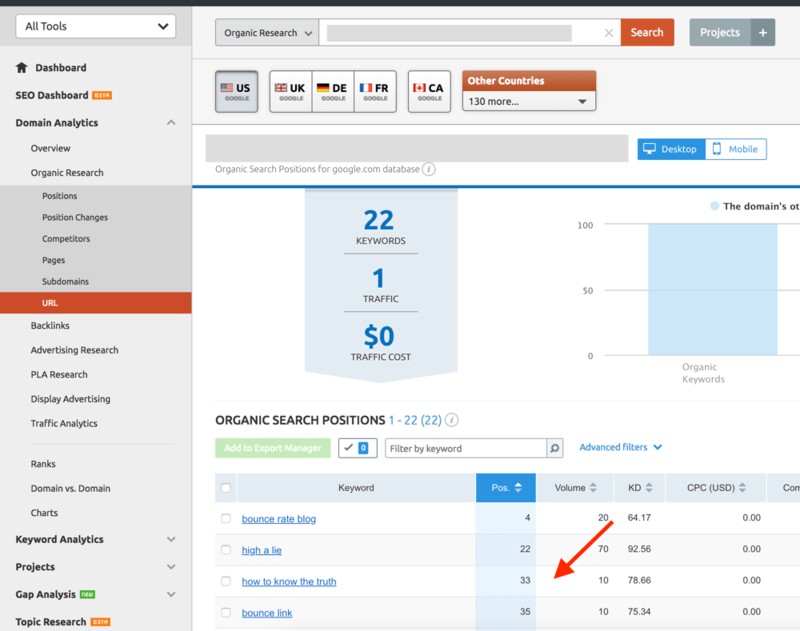 I’m using SEMRUSH for this task and in particular the Organic Traffic Insights and Content Analyzer features. The Organic Traffic Insights report shows you the pages that generate organic traffic, you can use it to find out which pages have a high bounce rate. The content analyzer report gives you details about the pages including the number of words, date published, number of visits, keywords a page is ranking, etc. You can use it to find out which pages have little or no text and which pages have good content but no traffic. How to fix thin content? These are easy to fix. You need to decide whether to either remove them, de-index them but keep them on your website or improve their content. Product pages with no original content – if you are running an ecommerce website selling products from other vendors, it is possible that your product descriptions are an exact copy from the manufacturers website. This is a problem. Google can easily recognize the pattern and de-value your pages since they have nothing valuable or new to offer to the Google index or users. What can you do? Obviously, you can completely remove those pages since they are essential for your website. What you can do instead is try and improve the pages by adding original content. It’s not easy to do but there is a way to do it. Read my previous article on product page SEO for ideas. Pages used for navigation purposes only – There are cases where you have pages that have little content because their only used of navigation purposes. In this case just de-index the pages by applying the ‘noindex’ header tag and remove them from your sitemap. Old pages with little text content – If your website is old with many pages / posts, it is normal to have some of the pages that have content that is no longer applicable and you forgot about them. For example, an announcement you made years ago for a product release or new website feature. In such cases, you can safely remove (delete) those pages from your website and also remove them from your sitemap. If these pages have any incoming links or information that you believe users may still be looking, then you can do a ‘301 Redirection’ and redirect them to the most relevant and valid page on your website. Another group of pages that are most likely to have duplicate content on your website are your category pages. Category pages ‘get their content’ from the posts that belong to a category and this have nothing new to offer to Google or users. To help you understand this better, look at my category pages. They are optimized for particular terms (for this example for the term, “Latest SEO Articles“) and they do rank for those terms in Google, in the top positions. Optimize your categories to avoid duplicate content issues. The same goes with ecommerce category pages, read this: how to optimize ecommerce category pages. Landing pages or pages that their sole purpose is to be used for search engine marketing campaigns and have nothing new to offer to users, can be de-indexed and removed from your sitemap. A word of caution: If your landing pages have original content, do not de-index them. I’m referring to landing pages that have pieces of content copied from parts of your website or other websites on the Internet and have nothing ‘new’ to add to your website’s content. This is a tricky one. If you are familiar with how search engines work, you should know that not all of your published pages will have a ranking in the search engines index. Search engines have to index, process and crawl billions of pages and it is normal that the majority of your published pages will have low rankings or no rankings at all. Before making a decision as to which pages to fix, you should take into account the following fact: It takes time for a page to rank high on Google. 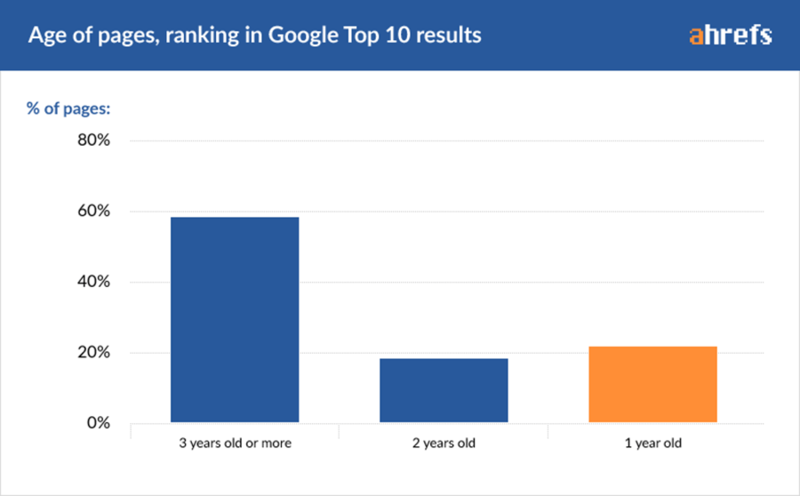 According to a study by Ahrefs, the majority of pages ranking in the top positions of Google are 3 years old or more and it may take months for a new page to appear anywhere in the top results. This means that you should exclude from your content audit, pages that were published in less than 6 months because their true ranking position is not confirmed yet. For the rest of the pages i.e pages that are older than 6 months but don’t have any rankings or traffic, you should try and improve their content by re-visiting your content SEO and on-page SEO techniques and resubmit them to Google for consideration. Paste the URL of the page into SEMRUSH to find out the keywords a page is ranking. If a page has any rankings (even if it’s on the second or third page of Google), for any keywords then you need to edit your content and optimize the page for those keywords. This means you may have to change your title, optimize your headings and add more content to a page that includes those keywords. Or take the content of that page, use it to make the content of another page better and change the canonical URL of that page to point to the newly updated page. This is a special category of pages and although they are not considered now as ‘thin content’ pages, it’s good to be proactive and fix the issue before Google decides to lower their rankings. Go to your Google analytics account and view the Landing Pages report and then sort the pages by bounce rate and find the ones with a high bounce rate. When a page has a high bounce rate it means that users did not find what they are looking for, or did not like the page content and the left without visiting a second page from your page. If they went back to the search results, this is bad because Google can understand this and if a lot of users are having the same behavior, it will gradually lead to lower rankings. This is known as ‘pogo sticking’ in the SEO World. In this case, the only solution is to try and improve the page content and make sure that it matches the user intent. Give users exactly what promised in the title and description of the page. 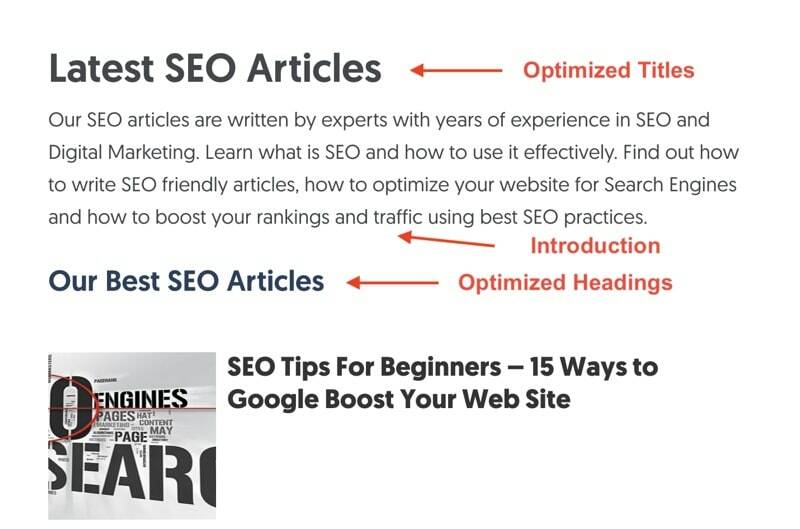 Hint: My previous post: How to create SEO friendly titles explains how to improve the page titles of your already published pages. You can use this advice as one of the measures you can take to improve your bounce rate. Thin content pages are bad for your SEO. It is your responsibility as an SEO or webmaster to review your content to find and fix thin content pages. The content audit process is time consuming (especially for websites with lots of pages), but necessary for the overall SEO healthiness of a website. Start by identifying which pages need to be handled and for each page decide what is the best course of action: to improve them, remove them or redirect them to other related pages. Keep track of your changes and always have in mind that it’s better to have a website with 100 top quality pages than a website with 1000 low quality pages. First, to improve any of your pages that are likely to be considered as thin content pages and be a step ahead of Google. Second, to be more careful in the future and only publish high quality content on your website so that you don’t have to go through the time-consuming process or reviewing and improving thin content pages. Glad my article helped you! Your post is very educative on how to identify thin content. As a blogger, this will be of help to me when am creating content on my blog. Better create high quality content from the beginning instead of having to look for ‘thin content’ later. Yes, it’s better to remove them from your sitemap too.